Meet My Baby Bunnies! What Do You Need To Get Started? 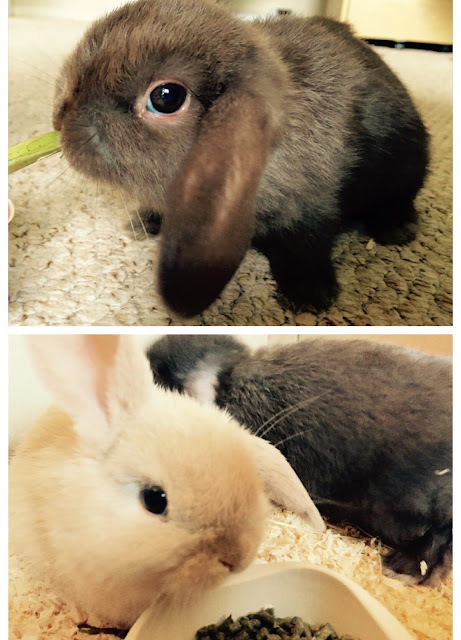 Last week we got two new additions to our household, two baby bunnies!!! Meet Coco and.....well, we still haven't decided on the little boys name yet - Cracker, Donny, Little Egg, the list goes on! I have had a rabbit before when I was much much younger but that was over 10 years a go, so I had to take to the internet to find out what was needed to get started, pretty simple right? They are pretty easy going animals to look after but you do need quite a few things to get started and these things don't come cheap but I managed to find some good deals online to get all the bits and pieces needed before bringing the little babies home! - Hutch: When I started looking online and in Pets@Home there were so many to choose from, and, they are quite expensive! I found lots that I liked the look of but I didn't want to spend a fortune so eventually I found one on Ebay (free and fast delivery) which was a complete bargain at £49.99 - I saw the same hutch on many different websites selling for £99.99. It was easy for my boyfriend (I couldn't build anything to save my life) to put together and the quality is really good. It is a comfortable size for two baby bunnies, I do however think I will have to upgrade to a larger hutch as they get bigger. 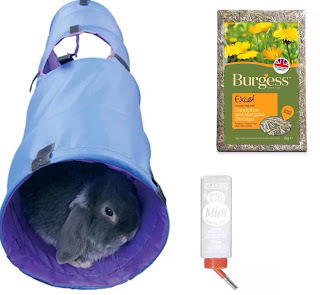 - Bedding: Rabbits need a nice comfy bed, so it's recommended to use dust free hay and sawdust to keep them cosy. I got mine from B&M, which in total including hay came to around £5.00. These bags will last a couple weeks. - Litter Tray: Some people litter train their rabbits and we decided this looked like a good idea after watching a YouTube video. 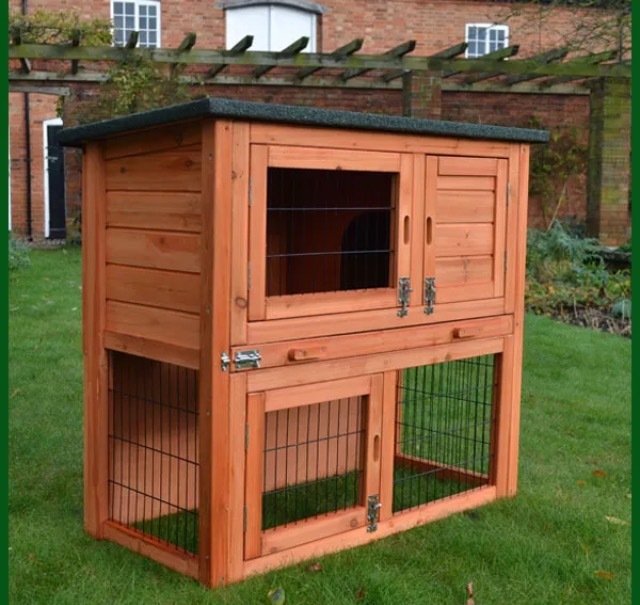 Litter training your rabbit helps keep their bed clean and tidy I got a rabbit litter tray that fits nicely into the corner of their hutch for £5.69 free delivery. - Food: There are lots of different foods to choose from and people have different opinions on what to feed their furry friends, as our two are only 8 weeks old they are on the pellets they came with from the breeder which, since having a Google, is a good quality food for growing bunnies called Allen & Page (for a 20kg bag £15.99 free delivery). As they get older we will change them to a different food, but we are yet to decide which one, any rabbit owners please feel free to recommend a good brand in the comments! - Water Bottle & Food Bowl: You can get these from all pet stores, I found some good deals on Ebay - water bottle £3.89 free delivery and an eco friendly food bowl £5.75 including delivery. - Toys: Rabbits do need stimulation to keep them occupied so toys are a must. You don't have to spend a lot on them, at the moment we are still trialling out what Coco & Little Boy like to play with. Currently their favourite thing to do is nibbling on my PJ's or the front door mat!!! However we have bought them a tunnel, which was recommended (£6.49 free delivery) to play in and some wooden sticks (£1.00 from Wilkos) to chomp on too. - Treats: As our bunnies are still babies and it's advised not to give them too many treats. It's totally up to you what treats you give them, they range in price and quality, but for now, our bunnies are happy with their hay and the odd dandelion leaf now and again. Lots of treat ideas HERE. - Love, Cuddles & Time: Handling rabbits from a young age is very important to get them used to you, plus it makes it easier if they need to go to the vets or, like me, you have friends and friends children who want to cuddle and play with them. Coco & Little Boy are very tame and love cuddles, we bring them into the house to play at least once a day so the can explore and have time around us, they are fearless little things at the moment and are not phased by the TV, hover or us wondering around the room. - The Bunnies: We got our bunnies from a lady in Liverpool who had a couple of rabbits herself, they are mini lops and cost £80 for the two of them. APPROX SET UP COST £175.00 - They are worth every penny to me however if you are thinking of getting a rabbit you need to remember to think of the on-going costs of food, bedding and insurance. I am smitten with our new additions, any rabbit tips are much appreciated! Oh how adorable! I've always wondered what you need to own rabbits! Oh they are so adorable. We are considering getting our first family pet, my little ones would love these bunnies. Thanks for the really useful start up information, it's a bit daunting working it all out! Hope they are settling in well! I'd for sure focus on finding a nice good hay and top of with some nice green veggies (but google before giving them as some can be bad for them) top top up. Rabbits actually have pretty complex digestive systems and one of mine died through tummy problems which is quite common sadly, that's why I'm saying this haha...not trying to be all know it all or anything. Aw they are just the cutest! I reeeeally want bunnies but need to wait until we have a garden first! Oh My Gosh - these two are just adorable!! <3 I'd love one but I can't have anymore pets right now for health reasons. Such cute little things though!